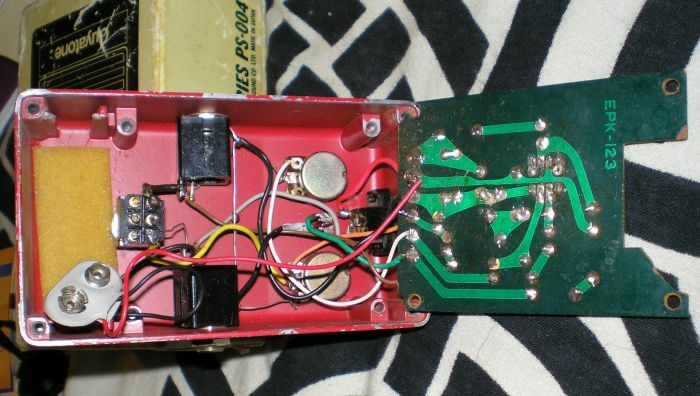 "Here's a fuzz-box-overdrive that I designed specifically for use with a Pignose. 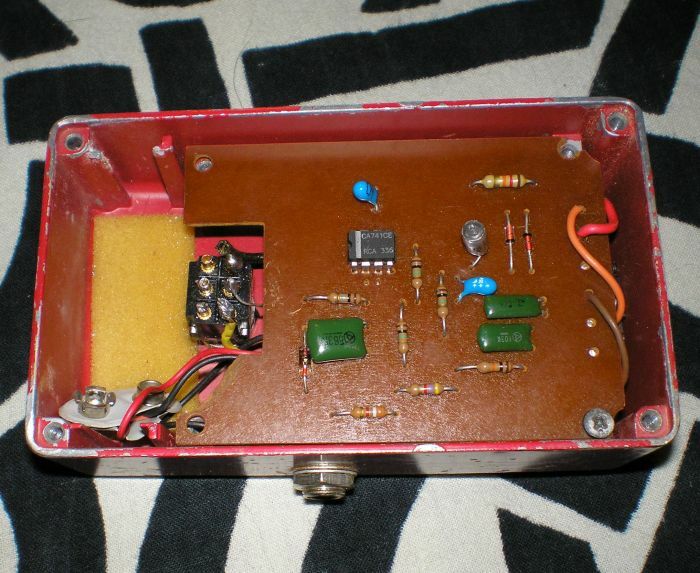 It fits into the case quite neatly and has the advantage of being small and working from 3 volts: 2xAAA cells. 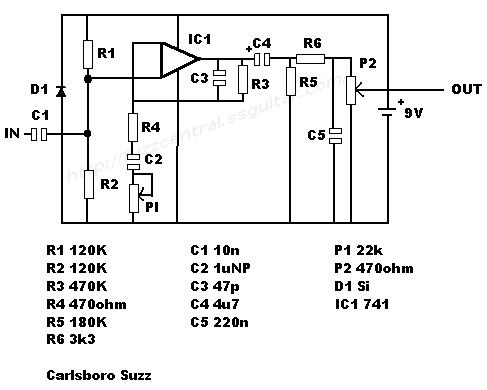 My circuit diagram isn't wonderful but I'm happy for anyone to build it. 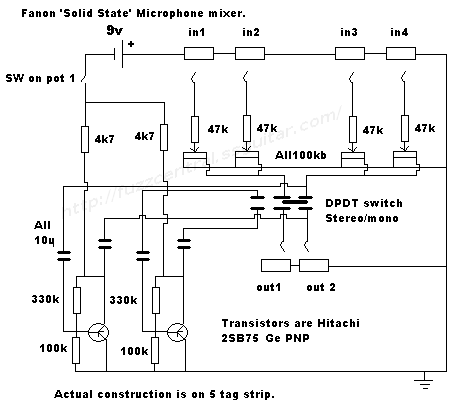 I put in a 270pF capacitor on the input because it enables the Pignose to have a louder input by cutting the bass and removing the sub-harmonics that are outside the human hearing bandpass. 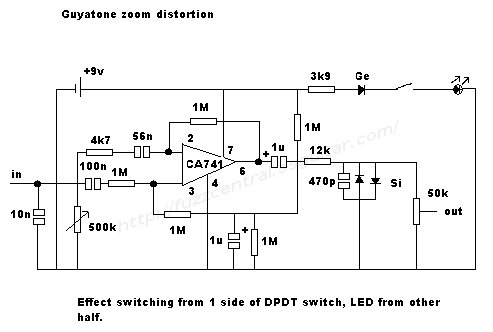 If the user ould like a deeper bass response, any value between 0.1uF - 10uF would work." 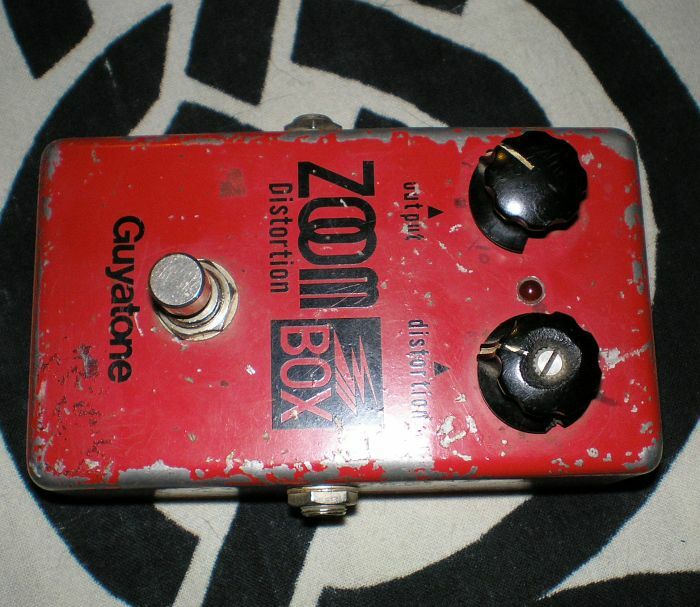 "Guyatone zoom distortion found at a car boot sale last weekend. Pictures are as bought, I've not had time to re-wire it properly yet. Pot values are measured as there is nothing on them. I presume they are both log." 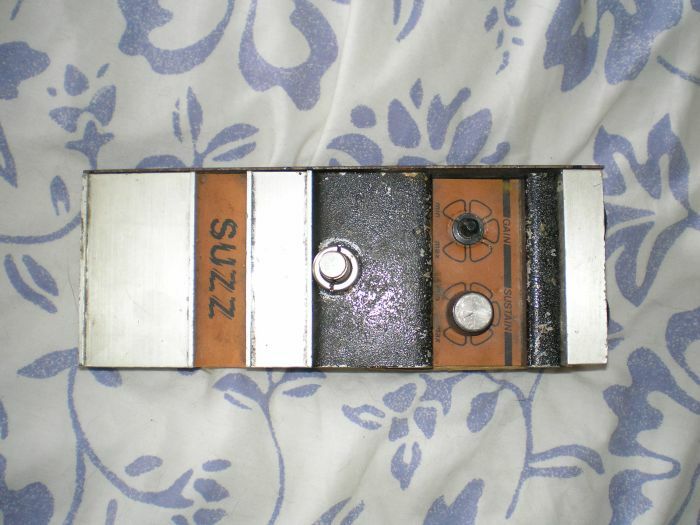 "I also found the attached pedal (Carlsboro Suzz) in bits and restored it. 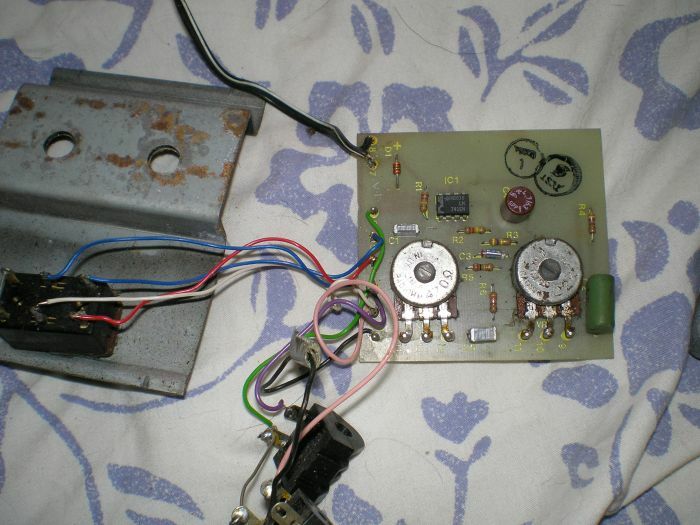 I had the plastic boxed version in the 80's but can't remember if the circuit was the same. Not very exciting but it is a punk classic!" "You might be interested in this which I recently repaired. 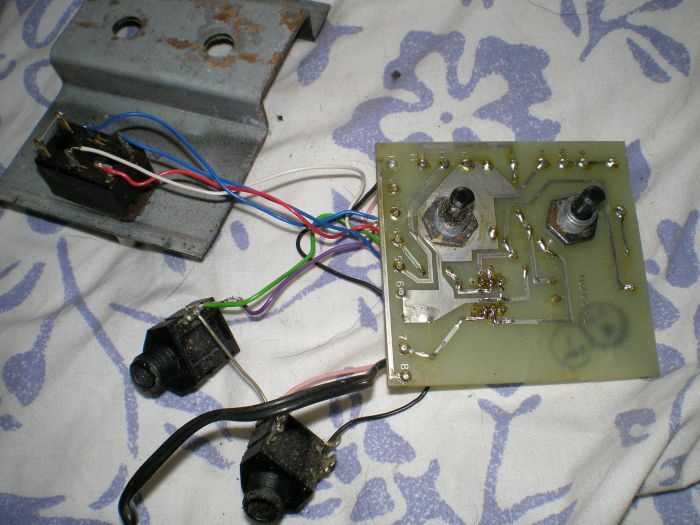 It's not a pedal but it's a useful microphone mixer that uses Ge transistors, a 9v battery and would be easy to clone. The original was built on a 5 tag stripboard with the centre as earth. It took me some time to work it all out a the original out connectors had been replaced with jack sockets and it had been very poorly wired. The resistors are huge carbon comp types. No hiss though!"
. Be sure that your images aren't HUGE in size since, for the time being, I'm stuck with a low-speed connection! For best viewing, please set your monitor resolution to 1280 x 1024. Copyright © 2001-2011 Phillip Bryant. All rights Reserved. No portion of this site is to be reproduced without prior written consent. Site last updated on May 20, 2007.